The latest breed of radios can play media files. Some others try to pass themselves off as alarm clocks, lava lamps and toys while being able to tune in to your favourite station in a jiffy. "This is All India Radio." For Indians above the age of 30, it is hard to remember a childhood without these words being a part of life. Of late, of course, the radio has been relegated to the position of an additional fitting in phones, headphones and other such devices. The only place we listen to radio is in the car, but that too is a luxury limited to urban areas. Internet radio has revived some of the charm of listening to a broadcast in which you have no idea what is going to come next, but bandwidth has been a hurdle for this listening pleasure. Meanwhile, satellite radio died early due to its high costs and the need for subscriptions. After becoming a device that caters primarily to the rural market, the radio, or the transistor as we like to call it, has started evolving. In keeping with the times, the latest breed of radios can play media files, others can power themselves using solar panels or a dynamo, the rest try to pass themselves off as alarm clocks, lava lamps and toys while being able to tune in to your favourite station in a jiffy. The radio of the new era is here. "This is All India Radio 2012." 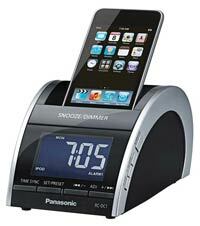 This a radio, but it is also an alarm clock and an iPod dock. The RC-DC1 has two stereo speakers that produce 2600 mW sound output, auto scan tuning and 5-FM/5-AM presets. 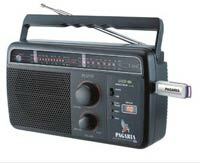 This is one radio that retains all the old world charm. But then you notice the price and realise that there has to be something extra. This one looks nothing like a radio. It is only on close inspection that you can make out that this is not a lamp, but a radio with an LCD display and auto-scan tuning. But, sorry, only FM here. With an LED display, analog tuning and a 100 MW output this has the specs of a decent radio. But then the AJ3115 is also a full-fledged bedside alarm clock with sleep timer and repeat alarms. This table-top FM radio comes with an LED display. The alarm has extendable snooze and sleep timer while the AC power cord works as the FM antenna. This superbly designed radio has an other-worldly digital display, a 600 mW output and rotator volume control. It comes with an inbuilt alarm that has customisable multicolor mood lights, power backup and sleep timer.